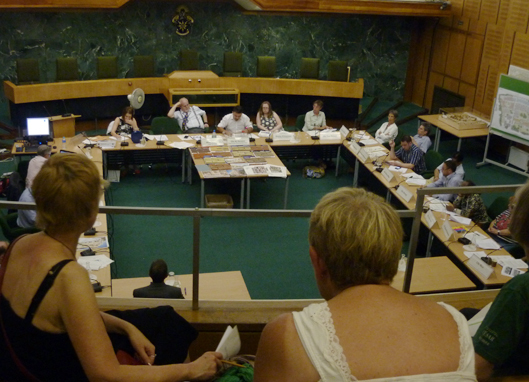 Last night’s presentation by Bruce Moore, CEO of Hanover, seemed to us in the gallery an eloquent and convincing case for meeting LB Haringey’s policy requirements for general needs social housing. The arguments were not that easy to follow, but the core of the Hanover case was that 51 older tenants of the borough’s existing stock would be offered incentives to move out of under-occupied social housing, freeing this up for the families the Council wishes to house – and therefore housing more people. Not only would older tenants be offered very attractive alternative housing in a desirable area but Hanover would add its own cash incentives per bedroom to the cash offered by the Council. This was not an argument most of the planning committee members wished to accept. The borough has large numbers of families in dire need of rental accommodation. The problem for Hanover – and therefore for Cohousing Woodside – is that the spread of general needs housing is uneven through the borough and councillors wish to redress this by locating it specifically on the St Luke’s site. That Hanover, as a charity constitutionally restricted to housing provision for older people, cannot provide for families, was an argument that fell on deaf ears. The housing association has upped its numbers of social rentals, all to be provided at no cost to the public purse and effectively subsidising the borough’s housing stock in the absence of grant. However, this is for people over 55. Moore quoted to the Committee its own policy priorities relating to older people, but these did not seem to be rated as important by the councillors. When challenged by a councillor to bring a more family-oriented housing association to the St Luke’s site to deliver the general needs housing, Bruce Moore stated that this could be possible, but the result would be a much smaller total number of homes provided, as Hanover’s investment would and could not be on the table. A clear majority of committee members decided to reject the application on the grounds that it failed to meet the Council’s policy requirements for general needs housing – ie. family housing, not housing for older people. Hanover’s position was that the Council’s requirements were contingent on ‘viability’. In other words, with an objective assessment of how the finances stack up, a calculation of how much social rental accommodation could be provided. Opinions on ‘viability’ at the July planning sub-committee remained poles apart. Thus Hanover will appeal. For the Cohousing Woodside group, this position was not unexpected. It means considerable further delay. However, it also affords us more time to grow and consolidate the group. If the appeal supports the Council’s arguments, and compromises are forced on Hanover, there may be knock-on consequences for the Cohousing scheme, but these remain to be seen. For the locals around St Luke’s, their fears about over-burdening local schools may turn out to be well founded. For Haringey residents in the over 55 age-bracket, particularly those affected by the bedroom tax and looking for somewhere smaller to move to, the message seems to be that there is adequate sheltered housing and they are in no way a priority of Haringey Council.